Imagine you are sitting down, reading the current issue of a foodie magazine. It is the December copy, which arrived in your post box as a subscriber in November. That means it had to go to print say in October. Which indicates that the editorial copy was written in September. And of course, the recipes would have had to have been made and shot sometime in August. With food that is not seasonal! This does not sit well with me for my blog, and so recipes you see here are as seasonal as they can be. But, that does not help when you want to showcase recipes you can serve for your Christmas meal. Some recipes such as this Ginger Ice Cream can be made at any time of the year, together with the Christmas mince I made to mix into it. Last Christmas it was super hot here in South Africa and dessert for our family meal had to be something cold. 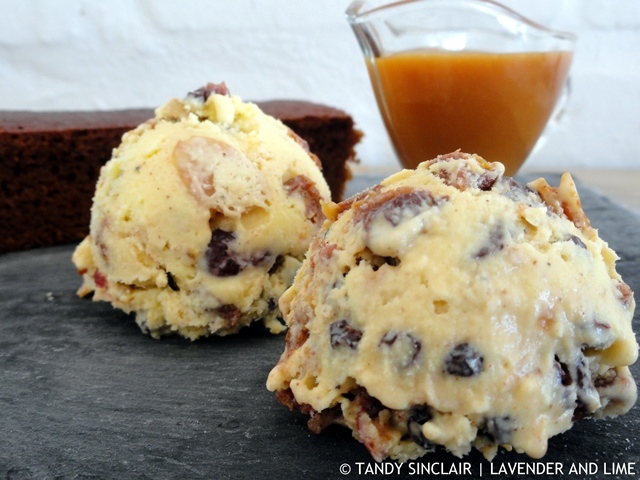 I made this ginger ice cream to enjoy as dessert, and saved the recipe to showcase this year. This December promises to be another scorcher so I may be tempted to make a variation of this again, and who knows, I might share it with you next year. Ginger ice cream? Sounds so odd, but it looks absolutely amazing! I must live under a rock because I’ve never heard or had ginger ice cream! Tandy this sounds absolutely divine! Perfect ice cream for this time of year, it sounds great. Tandy, what a marvelous idea! That sounds sooooo good! I’m definitely marking this for when I get my ice cream freezer out. I just made mincemeat and put some in the freezer, so I’m set to go! Sounds gorgeous – I love the flavour of ginger – it’s warming and refreshing at the same time! Just adore ginger, the more the better, so this is a great ice cream. Any time of year works for ice cream, I have it cozy and warm inside while looking at the snow outside. I sitting here at my computer trying to think what ginger ice cream will taste like and it’s beyond my imagination! So I can’t wait to give this a whirl. And I think the slightly nauseous pregnant women out there would absolutely LOVE this Tandy. So creative. Now, THIS is my kind of ice cream. I just love anything with ginger in it, but I think it would be extra special with some chocolate chips in it too. Well I just love this and so easy too. I have very few pieces of fancy cooking equipment but I do have a small ice cream maker, which I love. I’m a big fan of ginger too.